When Lara Roessler thinks about coworker Gary Moline, a quote from Maya Angelou comes to mind. 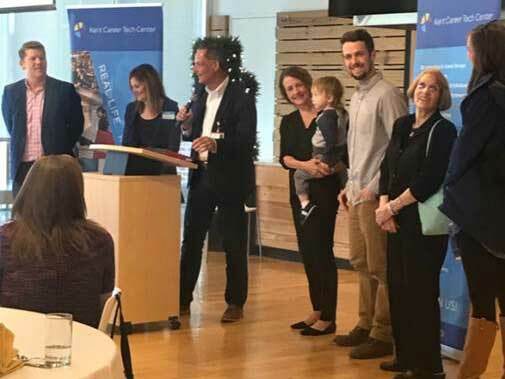 After 35 years in education, 28 with Kent ISD and 23 as a counselor at the Kent Tech Center, Moline was presented with the West Michigan Counseling Association’s “Counselor of the Year” award. “Gary has this amazing ability to connect with all people,” said Roessler, a fellow counselor. “He has an incredible zest for life and a love for humanity. To know him is to love him. The award was a surprise for Moline at the WMCA annual awards banquet Friday, April 20, and was given to him in front of his wife, son, grandson, 90-year-old mother and his daughter-in-law. Congratulations Gary! So well deserved!